We involve our clients in every step of our R&D process. We present our findings and progress to our clients to create a better understanding of how our vision can operate in our client’s environment. Feedback from our clients will then be processed in our R&D process. This way we aspire to create a final product that suits our client’s needs as well as we can. Daily contact between employees assures detection and prevention of bugs. Interactions hold more importance in this process than following a strict process of development. The process will be divided in smaller portions. This helps detecting and fixing bugs in an early stage to assure that the process will not be delayed. Furthermore this will help to keep the creativity flowing and to keep a clear mind during the process. While working on the smaller portions however, it is important to not forget the bigger picture to prevent the final product from becoming disjointed. In sum the three most important aspects of agile development are communication between ZES and the client, communication between employees and dividing the bigger problem into smaller portions. 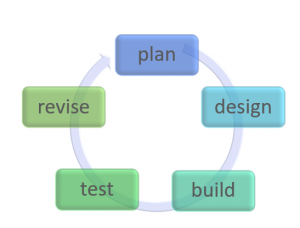 In practice this means that we walk through the following circle several times during a project. The end product will be delivered after evaluation by us and the client and only if there seem to be no flaws or mistakes left. Compared to the traditional waterfall method agile development has multiple advantages. The traditional waterfall method follows the cycle shown above once, elaborately. Essential for the waterfall method is a perfect plan and design from the start, in order to achieve an end product with no flaws or mistakes. Agile development leaves more room for regular tests and evaluations to ensure there are no flaws or mistakes in the design. Nevertheless if a mistake or flaw is discovered, it can easily be resolved, due to the short cycles wherein these flaws or mistakes can originate. This way not only money, but also time can be saved when compared to the waterfall method, wherein the whole elaborate cycle has to be followed again after discovery of a flaw or mistake in the end product. Another advantage of agile development is that our client has insight in the way the end product is created. This way our client will be able to provide us with knowledge about their wishes and wanted adaptations.